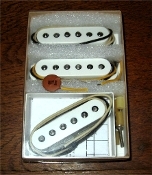 These pickups are designed to fit in Stratocaster and similar guitars, built to last, with traditional vintage materials, details, and methods. The examples here are stock versions, of proven popular designs. If you don't see what you want, please use the contact page to request a quote on custom versions to match your individual needs at very reasonable prices.